One could easily mistake the Como Audio Duetto as a vestige of the Rat Pack era. The half-inch walls of its cabinet are sheathed in a furniture-quality wood veneer rarely seen these days. There are six radio preset push buttons above the display, and three old-fashioned knobs below it. But that nostalgic feeling evaporates as soon as you push the leftmost knob to turn the radio on, and an analog clock face changes to a grid of icons that includes the Spotify logo. The 3.2-inch display doesn’t boast a high resolution, and it’s not a touchscreen, but it hardly matters. Most speakers in this class don’t include a display at all. And if you must have a touchscreen, download the Como Audio app to your smartphone (there are Android and iOS versions). Don’t want to use your phone? There’s an infrared remote, too. However you choose to control the Duetto, you’ll be able to access music from just about any source you have, whether it be online (Spotify Connect, internet radio); on your network (from a DLNA media server running on a NAS box); on your smartphone (connected via Bluetooth, with NFC for easy pairing and aptX codec support for near-CD audio quality); a USB drive (the Duetto can enumerate and decode everything from AAC to FLAC, MP3, WMA, and WAV files); or terrestrial FM radio (DAB/DAB+ in the areas of the world where that standard is available). The Duetto covers all the bases in terms of audio inputs and outputs. One of the few ways you can’t feed it music is by “casting,” at least not natively. You can power a Chromecast Audio dongle (or even an Amazon Echo Dot) from the Duetto’s USB port and plug a 3.5mm cable into its aux input. Need even more flexibility? There’s a Toslink digital optical input and a 3.5mm headphone jack, too, though it would be more convenient to have the latter mounted in front. I streamed music from a variety of sources, including Spotify, internet radio, a WD My Cloud Mirror NAS box on my network, Bluetooth from my phone, and finally from a USB flash drive and then a USB hard drive. The chief benefit of the Duetto’s support for Spotify Connect is that the music streams over Wi-Fi versus from your phone via Bluetooth. The music will never be interrupted by a phone call. Having Spotify Connect onboard is much preferred to streaming Spotify from your phone (provided you’re a Spotify subscriber, of course). The radio had no problem spinning up newer-vintage mechanical drives, but it couldn’t provide enough juice to spin up an old 250GB Seagate FreeAgent Go that I found in my closet. No great loss on that score, as far as I’m concerned. I typically play music from the NAS box or stream Spotify or Tidal when I want to hear tracks I don’t already own. Come to think of it, Tidal would be a nice addition to the Duetto’s repertoire. The Duetto has a 30-watt-per-channel (RMS) Class D amplifier driving a pair of 19mm soft dome tweeters and two 3-inch long-throw woofers. A rear bass port helps with the reproduction low of frequencies, and the radio benefits tremendously from having a wall or other vertical surface behind it to reflect those sound waves. Even then, the bass doesn’t travel all that far, and it doesn’t deliver the kind of chest-thumping bass that I’ve enjoyed from some other high-end tabletop speakers—Bowers & Wilkin’s Zeppelin Wireless, for instance, or the slightly larger Sonos Play:5. Nonetheless, I found it to be more than enough for my 247-square-foot home theater, at least for casual listening. Both the Zeppelin and the Play:5 are also considerably more expensive and lack a whole lot of the Duetto’s other features. Speaking of Sonos, Como Audio says the Duetto can be part of a whole-home audio set up, but the company didn’t send multiple speakers, so I couldn’t evaluate it as a Sonos competitor. A rear bass port helps the Duetto deliver more bass than you’d expect from its 3-inch woofers. Listening to the title track of Julianna Raye’s Dominoes, encoded in Apple Lossless, I was pleased both with how well the Duetto delivered Raye’s lilting vocals as well as the acoustic bass lines in this bossa nova tribute. The music just felt right coming out of the Duetto. 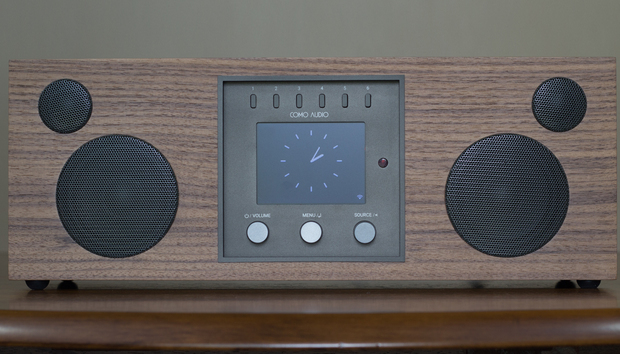 Como Audio’s tabletop radio sounded great with other types of music, too, delivering the opening splash cymbal in Steely Dan’s “What a Shame About Me” (ripped from CD and encoded in FLAC) with crisp authority. The Duetto isn’t a ground-pounding audio system. There’s no subwoofer option, and it will tip over into distortion if you push it too hard. Still, it gets plenty loud before you approach that limitation. The Duetto is a lovely and remarkably flexible audio system, capable of delivering strong performances with just about any type of music from any source: Your own network, internet radio, a disc player, Spotify, USB storage, or terrestrial FM radio. I can’t think of any other music source apart from satellite radio. And if you really want one of those, you could easily plug one into the Duetto’s aux inputs. « Will you finally read the iTunes Terms and Conditions... as a graphic novel?